We respect the fact that there would be differences of opinion if we were truly to run the above as a survey, but one way or another, only the Grizzly Adams of the world would answer “D”. For the rest of us, the only question is just how aggravating any period of time would prove to be in the absence of indoor plumbing. 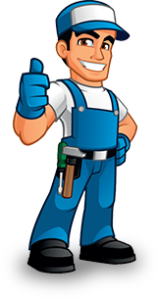 For as long as we’re around, your wait time to get any plumbing problem fixed will be just as brief as possible. We even provide 24/7 emergency repair service to further cut down on wait times. Plus, with well-stocked service trucks, our plumbers come prepared for to get the job done without having to leave your house for one or more additional parts. At the same time, please don’t get the idea that we rush through our work. We’re simply pointing out that plumbing problems can wreak havoc with your day, and that we do everything we can to minimize that. But never at the expense of quality workmanship, adhering to local plumbing codes, and adhering to the highest standards of family and home safety.